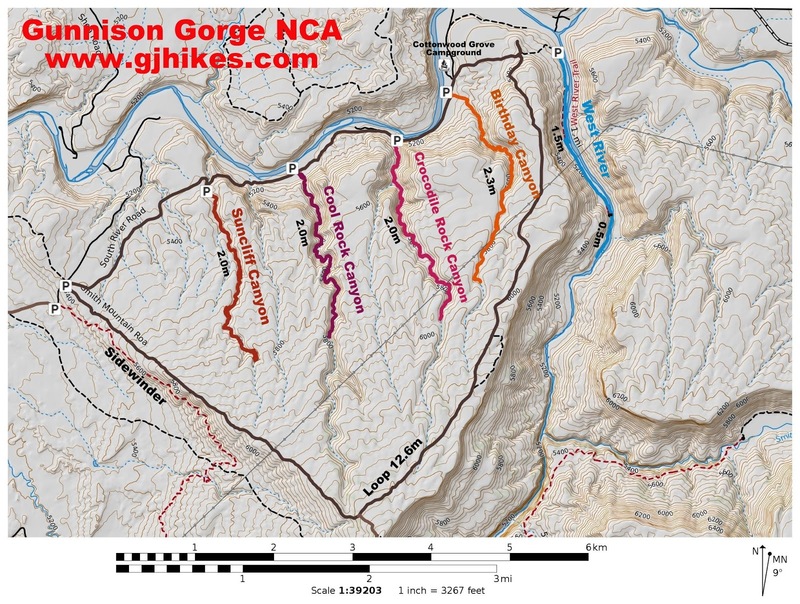 The West River trail is located in the Gunnison Gorge National Conservation and Wilderness Area near Delta, Colorado. The trail begins near the confluence of the Gunnison and North Fork of the Gunnison Rivers at the end of the South River Road. From there it travels into the Gunnison Gorge along the west bank of the Gunnison River. The trail provides access to one of the best Gold Medal rainbow and brown trout fisheries in the State of Colorado. To get to the trailhead drive east out of Delta for 7 miles on Highway 92 to Austin and turn right onto 2200 Road. Follow 2200 Road for about 1 mile and turn left onto H75 Road. It is about 3 miles to the Smith Mountain/Sidewinder trailhead where there is a restroom and another hundred yards or so to the Smith Mountain Saddle trailhead. As you continue the road forks with H75 following the left fork on a better looking graveled road. Follow sign for the middle fork that says South River Road for 5 miles to where it ends at the trailhead. The road is normally passable by most any vehicle with a careful driver during good weather. Everyone will have to judge for themselves whether their vehicle is suitable for the roads current conditions. The trail starts out following an old jeep road although there is a side trail that heads down to the river where there is a bridge that crosses an irrigation ditch. After a short distance the trail travels around a locked gate. As the trail continues it occasionally comes to spurs that lead down to the river. All of the spurs involve jumping across the irrigation ditch to get to the river. Even if fishing isn't on the agenda the ambience near the water's edge makes for a pleasant hike as well as providing some nice settings for a picnic. Eventually the trail reaches a dike where the irrigation ditch begins. To continue up the canyon requires backtracking to find a suitably narrow spot to cross the ditch and get back on the main trail. Once past the dike the main trail continues into the gorge and at times get quite a bit higher than the river. Like before there is also the option to follow the route that is closer to the river itself. The official end of the trail is near the ruin of an old stone building around the 1.5 mile point. Those that would like to hike a little further can keep going along the water's edge. For this post we continued a little past the 2 mile point where there was a patch of poison ivy that was thick enough that we didn't want to try to get the dog past it. We could have easily gotten around it but we didn't want to risk the dog getting the oil from the plant on itself and then transferring to our vehicle and everything else. One of the nice things about the Gunnison River from the confluence up through the Gunnison Gorge and the Black Canyon of the Gunnison National Park is that the water is always clean and clear. All the sediments settle out for the most part in Blue Mesa Reservoir which has a maximum depth of 341 feet. 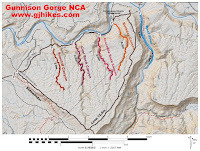 After that is still passes through the Morrow Point Reservoir and Crystal Reservoir. Besides providing fishing access to its gold medal waters the West River trail can be a pleasant hike. If you would like to see it for yourself then all you have to do is 'Take a hike'.